Democratic debate: Hillary Clinton bashes GOP for hypocrisy on Planned Parenthood and paid family leave. 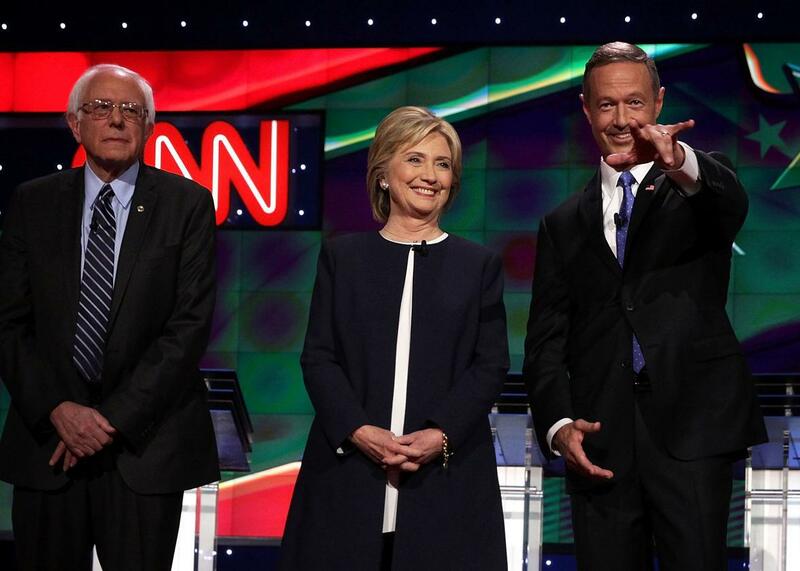 Bernie Sanders, Hillary Clinton, and Martin O’Malley at the Democratic debate in Las Vegas. The three front-runners in the Democratic primary all came out strong for paid family leave in their first debate. Hillary Clinton had an edge, as she did throughout most of the night’s proceedings, using her personal experiences as a mother to bolster her position. Clinton also took the opportunity to wedge in the night’s only reference to reproductive rights. Moderator Dana Bash asked Clinton to respond to Republican primary candidate—and winner of the last debate—Carly Fiorina, who’s contended that federally mandated paid family leave would squash job growth. Bash pushed back, arguing that some taxpayers might object to another government program.